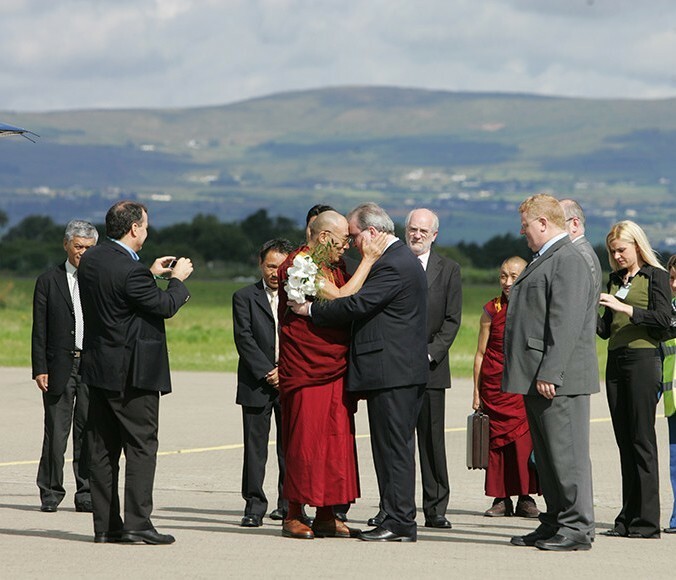 “You are my hero”, His Holiness the 14th Dalai Lama of Tibet told Richard Moore on 17th July 2007 whilst celebrating the tenth anniversary of Children in Crossfire in Derry. Gripping Richards hand, the spiritual leader of Tibetan Buddhists said. “Whether you believe it or not, you are my hero and a wonderful son of humanity. Despite your tremendously painful experience, you don’t have any anger or hate. You accept what has happened and keep your peace of mind. You are a good example and model”. During this visit, the Dalai Lama met privately with Richard and Charles, the soldier who blinded him in 1972. “It is wonderful to see the person who suffered and the person who caused the suffering become true friends, peace-process, ” said the Dalai Lama. “Their’s is genuine friendship and happiness which is based on forgiveness”. In May 2010 Richard and Charles travelled to India for a special audience with His Holiness at his residence in Dharamsala. 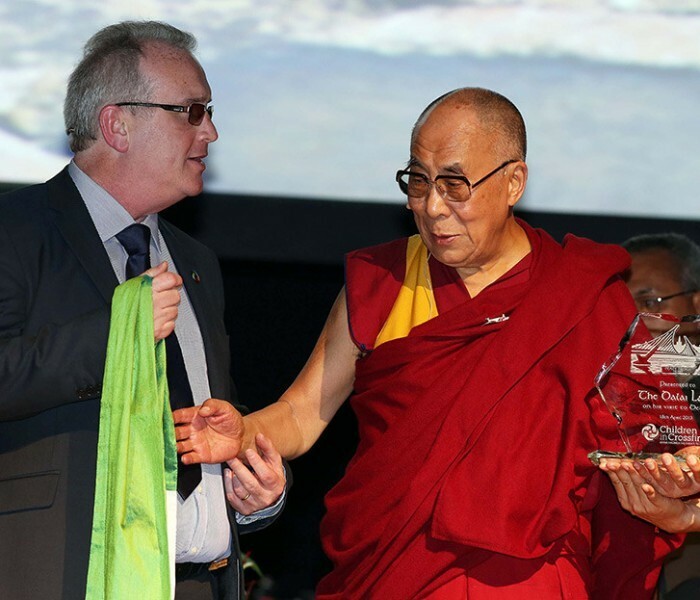 Whilst in India Richard and Charles spoke at an event at The Tibetan Children’s Village School, attended by over 2500 students, when His Holiness honoured Richard with a citation which the Tibetan leader read himself. In it, His Holiness says of Richard “Among the billions of people in the world you have provided a living example of the true practice of forgiveness and therefore a source of hope for every one of us”. It was during this visit to Dharamsala that Richard asked His Holiness to become Patron of Children in Crossfire, an invitation which he readily accepted.The extraordinary relationship between these two incredible exemplars has continued to grow and deepen. His Holiness has been a keynote speaker at various Children in Crossfire events and he and Richard are often asked to appear together. 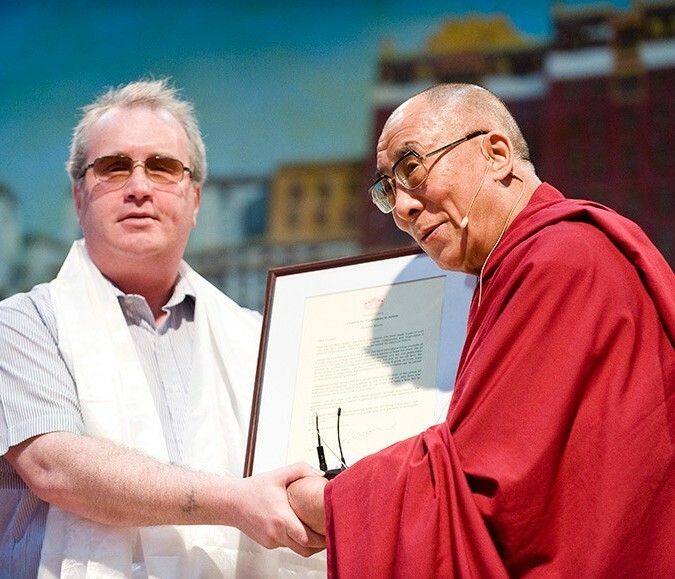 In his recent book “Beyond Religion” the Dalai Lama refers to Richard as being “a marvellous example of the power of compassion and forgiveness”. 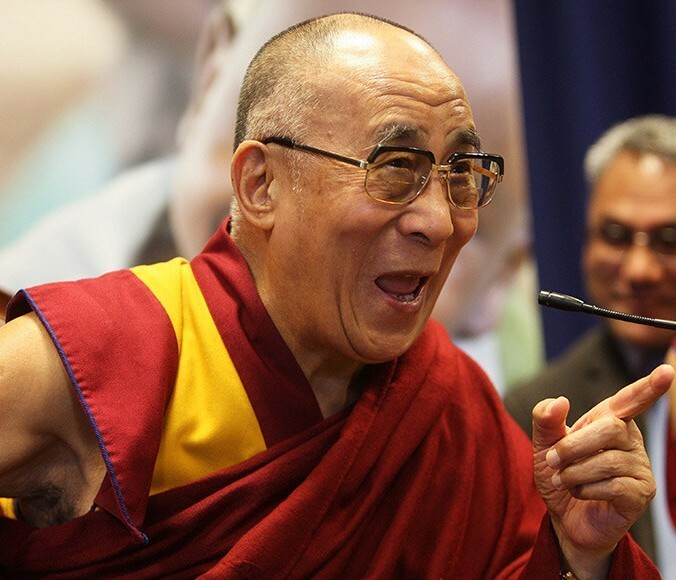 The Dalai Lama has been a key inspiration behind Children in Crossfire’s Educating the Heart initiative and specifically to the development of its TIDAL programme which seeks to provide a resource for teachers in addressing the issue of global citizenship in a way that results in a ‘felt’ understanding. The 14th Dalai Lama of Tibet is the spiritual leader of Tibetan people and a key proponent of world peace, the transformative power of compassion and the universal right to happiness. He has lived in exile in Dharamsala, India since 1959. His tireless efforts on behalf of world peace and human rights have brought him international recognition, including the Nobel Peace Prize in 1989. The preservation of Tibet’s Buddhist culture of peace and non-violence. 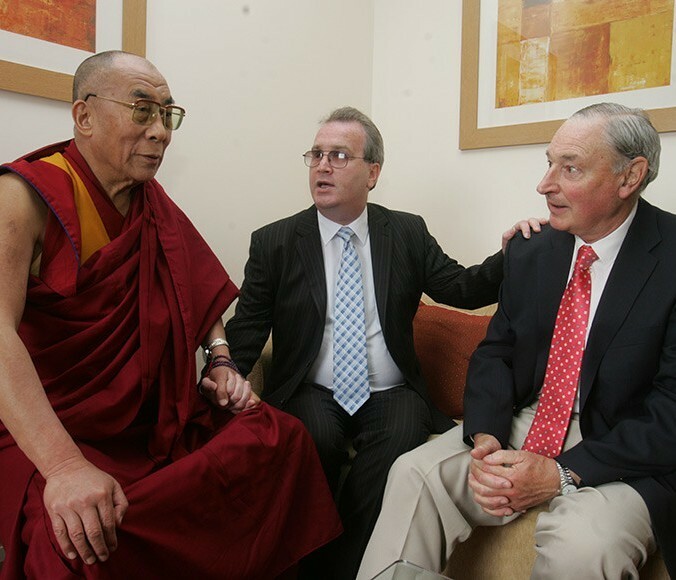 The Dalai Lama, Richard Moore and Charles Innis, the British Soldier who blinded Richard as a 10-year-old, 2007. 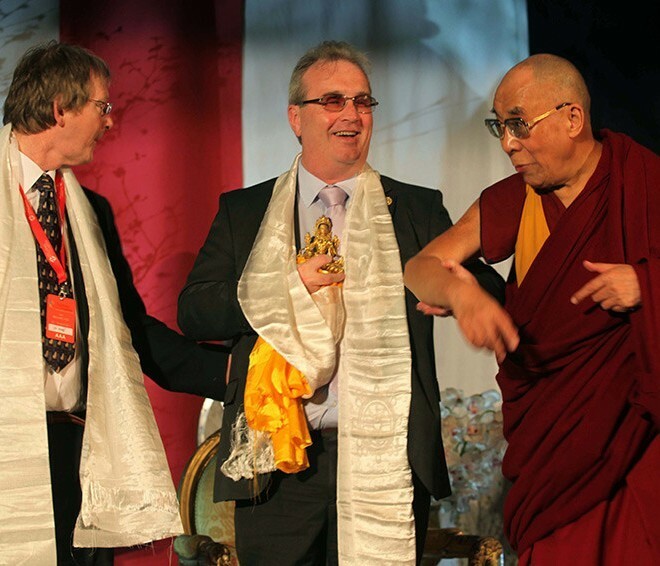 The Dalai Lama pictured with Richard Moore and Joe Murray (AFRI) at the ‘Possibilities’ event in Dublin in 2011. 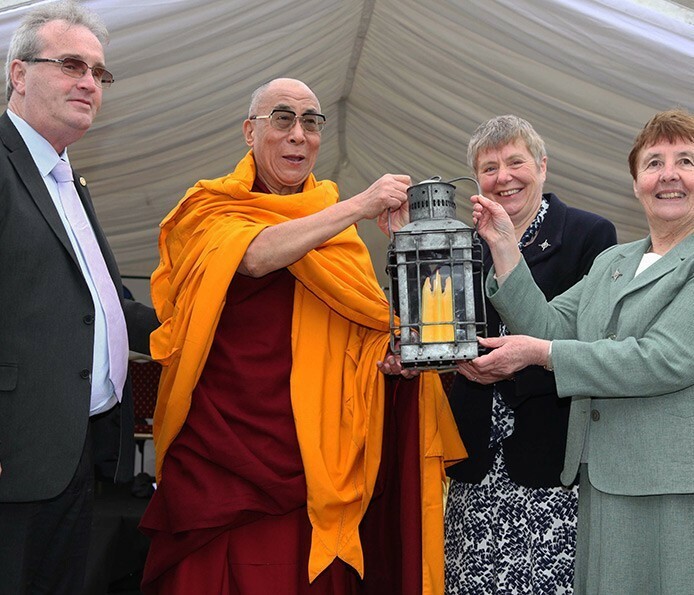 The Dalai Lama and Richard Moore are presented with the St. Brigid’s Flame in Kildare 2011. 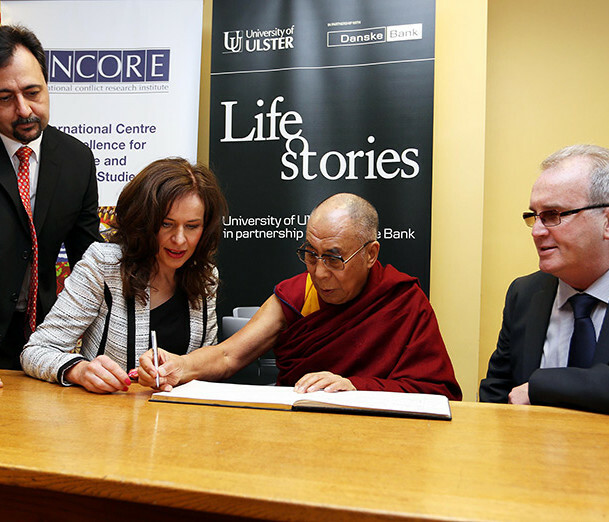 Dalai Lama giving a public talk at the ‘Venue’, Ebrington as part of his visit to Derry/Londonderry in 2013. 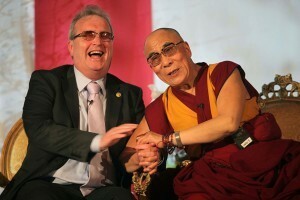 Dalai Lama and Richard give a public talk at the ‘Venue’, Ebrington as part of his visit to Derry/Londonderry in 2013.